Cartridge yields approximately 510 pages. 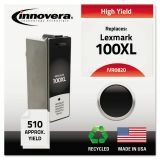 Innovera Remanufactured 14N0820 (100XL) High-Yield Ink, Black - Save money while getting great prints along the way. Innovera® remanufactured ink will save you money compared to nationally branded cartridges. Manufactured and tested to offer the same quality, performance and page yield.